Canada’s latest employment figures will hit the markets on Friday, at 1330 GMT. Forecasts and gauges of the labor market point to another solid report, which may help the loonie recover some of its latest losses. In the bigger picture though, the direction of oil prices following the OPEC decision later today may prove even more important for the Canadian currency. The loonie recorded hefty losses this week, diving to a 1½-year low versus the dollar, after the Bank of Canada (BoC) struck a more cautious tone at its latest meeting. Against the backdrop of collapsing oil prices, the Bank noted that Canada’s energy sector may be “materially weaker than expected”, and “data suggests less momentum” in Q4. Investors saw these as a signal policymakers will be more cautious in raising rates, paring back their bets for near-term hikes. Market pricing now implies a mere 26% probability for a quarter-point hike at the January gathering, while a hike in March is viewed more as a coin toss, according to Canada’s overnight index swaps. Thus, attention now turns back to incoming data, to determine whether a rate move in the coming months is indeed realistic, or not. This brings us to Friday’s employment data. In November, the nation’s unemployment rate is forecast to have held steady at the four-decade low of 5.8%. Meanwhile, the net change in employment is anticipated to have remained in positive territory and almost unchanged, at 11.0k. As for potential surprises, the Markit manufacturing PMI for the month indicated the “strongest job creation since survey began”, which in isolation suggests a positive surprise in these figures is more likely than a disappointment. Stronger-than-consensus prints could rekindle hopes for a rate move in Q1 2019, potentially helping the loonie to recover. That said, economic data in general over the next days may play second fiddle to moves in oil prices. In this sense, the outcome of the OPEC meeting later today could determine the short-term path of crude, and by extent drive oil-related currencies like the loonie. 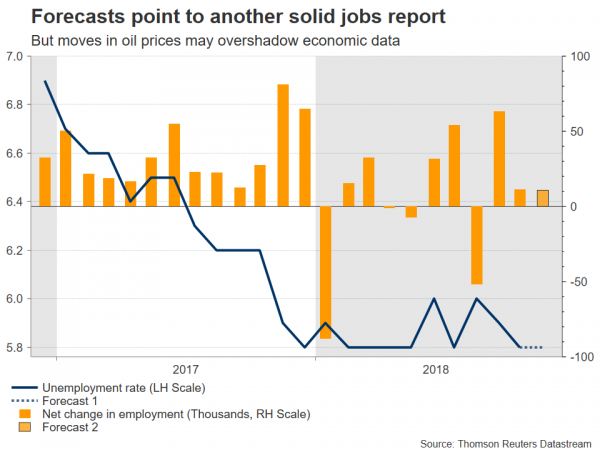 In other words, even robust jobs data may be unable to support the Canadian currency for long if OPEC disappoints and oil resumes its broader slide, for instance. Beyond OPEC, some remarks from BoC Governor Poloz at 1350 GMT today could also impact the loonie; if he echoes the cautious tone seen in yesterday’s policy statement, that may weigh further on the currency. Technically, further advances in dollar/loonie may stall initially near 1.3540, the high of June 9, 2017. An upside break could open the way for 1.3640, the inside swing low of May 5, 2017. Even higher, the 2017 peak of 1.3795 would attract attention. On the downside, preliminary support to declines may come at 1.3360, the top of November 28, before the December 3 low of 1.3160 comes into view. Even lower, buy orders may be found at the November 7 trough of 1.3050, assuming the bears can pierce the 100-day SMA at 1.3080 first. Note that the US and Canadian jobs reports will be released at the same time, so the reaction in dollar/loonie on the news will also depend on the American data.